New study provides more proof that Alzheimer’s is an autoimmune disease. Brain levels of the lipid ceramide are high in Alzheimer’s disease, and now scientists have found increased levels of an antibody to the lipid in their disease model. While some members of this lipid family are a plus in skin cream, inside the brain, ceramide appears to increase beta amyloid production and help the iconic plaque kill brain cells in Alzheimer’s state researchers from the Georgia Regents University. The team have identified elevated ceramide levels as a risk factor for Alzheimer’s and have shown that amyloid triggers excess production of the lipid, although precisely how and why remain a mystery. That synergy had the scientists expecting that generating antibodies against ceramide would hamper plaque formation. Previous studies showed that a drug that inhibited ceramide formation did just that. Instead the researchers found that the excessive ceramide had already worked its way into the bloodstream, generating antibodies that supported disease progression, particularly in female mice. The current study appears to support the theory that Alzheimer’s is an autoimmune disease, which tends to be more common in women and is characterized by the immune system producing antibodies against a patient’s tissue. The team has also theorised that measuring blood levels of the lipid or some of its byproducts could be an early test for Alzheimer’s, since ceramide levels were elevated well before mice showed signs of substantial plaque formation. The researchers state that excess ceramide in the brain results in the production of vesicles, which they liken to ‘lipid bubbles,’ called exosomes, that start piling up around brain cells. What’s in them depends on which cell type makes them, however, the lab had previous evidence that when exosomes get taken up by other cells, they trigger cell death. It takes a while before that becomes toxic because there’s ongoing traffic and clearance mechanisms, the team explain. At some point the clearance system stops working, and toxic levels of amyloid and ceramide pile up. That’s what led the group to adjust the ceramide levels downward by injecting even more ceramide under the skin, where it would mount an immune response and ideally slow disease progression. The team found elevated antibody levels already existed in their animal model. Data findings show that when more ceramide was introduced, it not only increased antibody levels, it also increased levels of plaque and exosomes. Female Alzheimer’s mice treated with more ceramide experienced about a 33% increase in amyloid formation and that serum exosome levels increased 2.4 times. The finding had the team wondering if exosomes, which can have a variety of functions including aiding communication, were trying to intervene and that the ceramide antibodies were blocking their efforts. Now the researchers are circling back to a previous approach of more directly blocking ceramide. The team theorise that the mice genetically programmed to get Alzheimer’s will produce less ceramide, less exosomes, and less plaques and are currently testing this concept. One in nine individuals over age 65 has Alzheimer’s, and nearly two-thirds of Americans with it are women, possibly because women tend to live longer, according to the Alzheimer’s Association. The leading hypothesis of Alzheimer’s is that an accumulation of beta amyloid plaque first alters communication between brain cells, then prompts cell death. Model for P2X7 receptor-induced signaling pathway involved in Micro Vesicle (MV) shedding. 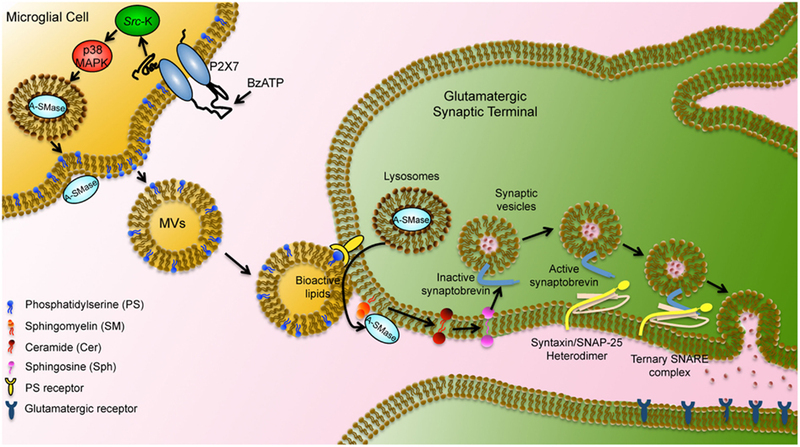 On stimulation with ATP or the selective agonist BzATP, P2X7 receptor activates P38 cascade through src-kinase-mediated phosphorylation. In turn, P38 triggers different pathways, among which PM pore formation (a), and mobilization of A-SMase from luminal lysosomal compartment to plasma membrane outer leaflet (b) where the enzyme alters membrane structure/fluidity leading to plasma membrane blebbing and shedding. Shed MVs carry IL-1β, present A-SMase and high levels of PS on their membrane outer leaflet. From Bianco et al. (2009). Microglial microvesicle secretion and intercellular signaling. Turola et al 2012.